Stories listed chronologically except for 1st story because it warms our heart so much. ​So far I've made a number of the beds for my local feral cat rescue and local dog shelter. It's going well and my husband and I really enjoy making them. Turbo had been at the Schuyler Shelter for MORE THAN A YEAR. 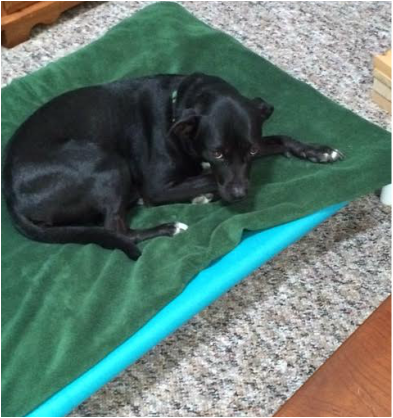 He got the first bed we sent to Schuyler and this is a photo of him using it. He LOVED it they said. Funny thing is, within one week of getting the bed, he was FINALLY adopted. They said he stopped "rushing" the front of his cage whenever someone came to see him because he was so cozy on his bed. People finally started noticing him for the nice dog he was and BINGO.....he has a wonderful home now! Gave me goosebumps when they told me. I thought that was pretty cool. Sure makes me want to make more beds.....for Harlan in Kentucky and as many other places as possible. Turbo. Waiting for a home for over 1 year. 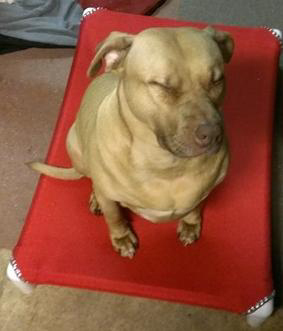 After he received his elevated dog bed, he was adopted within a week. Read why to the left. 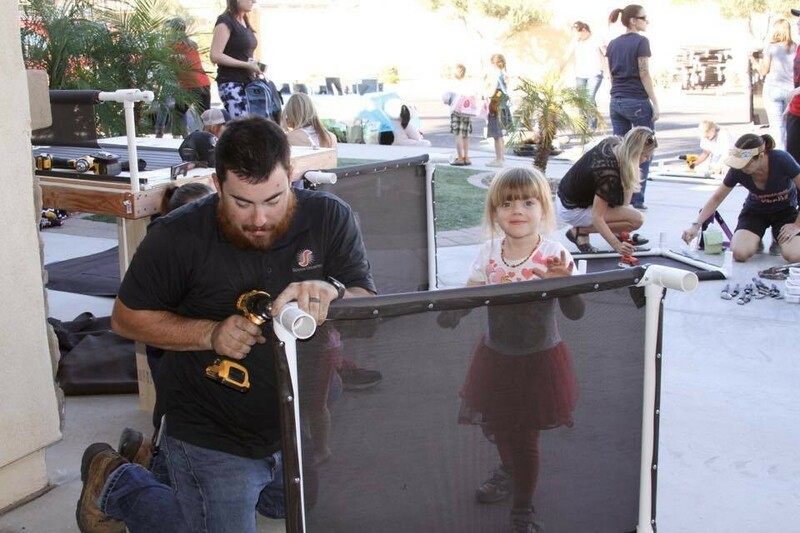 Gary & Pat, pictured with their kids, have made many elevated beds over the years. 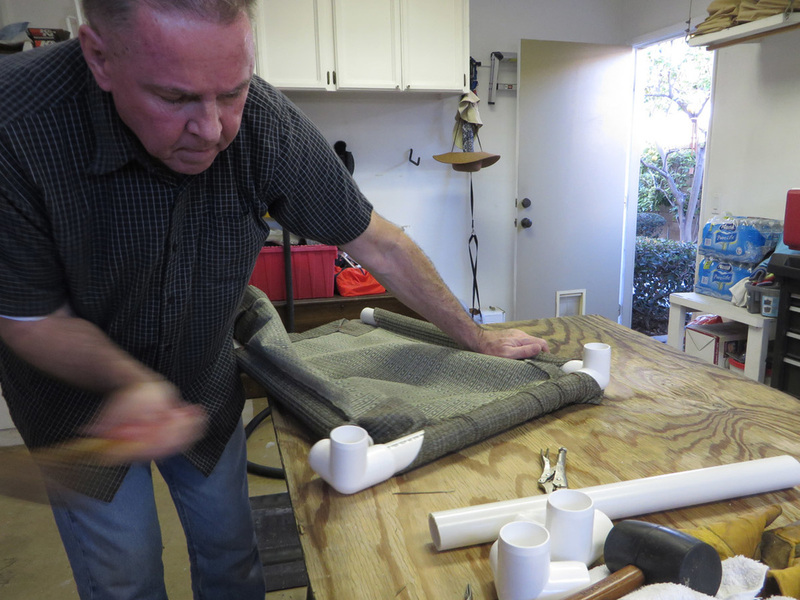 In fact, Gary used our design to come up with a sewn version of the hammock part, which eliminates the need for screws. It's a great option if you have a seamstress in the house. These beds were donated to Hope for Paws in Los Angeles. Way to go Gary and Pat ! 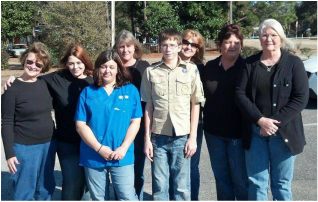 I just wanted to say thank you again for donating all the material for my sons Eagle Scout project ! 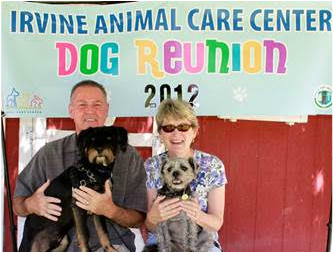 It was a great success and we will be donating 30 elevated dog beds to the Fairfax Co Humane Society here in N Virginia. Thanks so much for all you guys do! Dogs at Maricopa County Animal Care and Control have warm beds to sleep in thanks to the hard work of a group of dedicated volunteers. "I've been here many times, I foster a few, and I know they need beds, it's freezing out at this time," said Jill Smyros with Step Up USA said. She said the group of people from Gilbert made the elevated beds themselves. "This was my favorite event of the whole year. All the kids, all the parents, we had so many people. We almost had to turn them away, but we didn't," Smyros said. 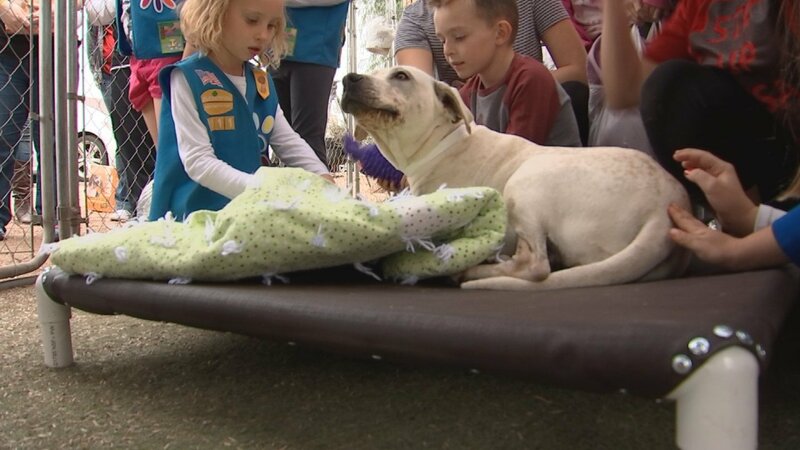 They delivered the 100 beds to some grateful pups on Sunday. "Huge impact, as soon as you put that dog bed in, the dog jumped in. It was awesome," Smyros said. "They're perfect for our kennels because we can sterilize them. They're heavy-duty. They last a while," Melissa Gable with Maricopa County Animal Care and Control said. At no cost to the county, Gable said they can't say "thank you" enough. "We actually cannot go out and solicit for donations so the fact that these people contacted us and tell us this is something we want to do really helped us out," Gable said. The dogs and the volunteers both benefit from this act of kindness, Smyros said. 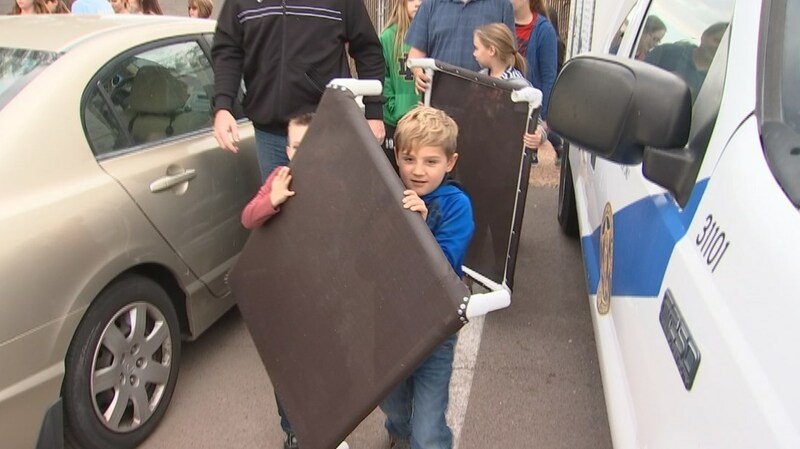 "I want to get the littles involved to make sure they know how to give back starting at a young age, so they love it and get used to it as they get older," Smyros said. Thank you for the instructions on how to make a dog cot. I have a rescued older pit bull that loves to lie under the tree and feel the wind in her face, rather than be indoors on her blanket. I followed your "large dog" pet bed instructions with good results. It was surprisingly easy and quick once I had the right materials. The only change I would make is the fabric. I used marine vinyl which is not holding up well. I'll try the Sunbrella fabric next and make more for the shelters in our area. 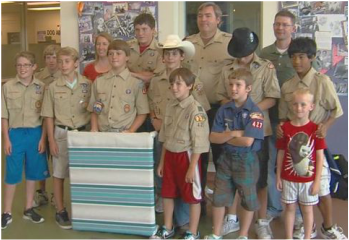 Blake Haskins, Bryan Grove and Jack Grove with Eagle Scout Troop 18 built 12 elevated dog beds for CARA. Drew McCutchan working on his Eagle Scout badge, made beds for a domestic violence shelter for the pets that enter for services. "I wanted to than you for the wonderful You Tube video that you created for the construction of the elevated beds that was a key part of my recent Eagle Scout project. Withou your efforts, I would not have had any idea as to how to build the beds. Thank you for hleping sme to make a difference in peoples' lives". ​We just delivered 25 NEW beds last Wednesday and I am just getting back from delivering 15 that needed repair from the ones that we first made in January. Makes it all worth it to see them enjoying them so much! Monroe Society for the Prevention of Cruelty to Animals is helping make the bed for the Monroe County Animal Shelter-MI"
​New Jersey Couple Makes Columbus Dog Connection Elevated Dog Bed for shelter who save their dog. 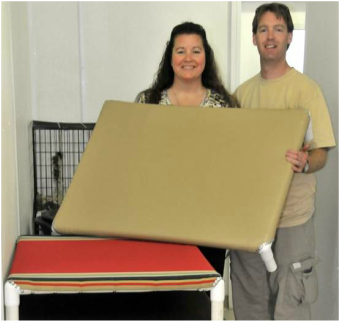 Steve & Tammy made/donated 40 of our elevated dog beds for the dogs at Associated Humane Societies in NJ. Their beloved pooch Gracie motivated them to help dogs in this New Jersey Shelter. 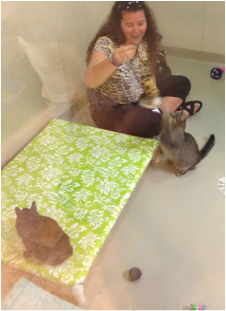 Kellie, as promised below are some pictures from both shelters that we donated the beds too. Some of the pictures are doggies laying on our beds. So cool and such a great feeling. A great day at the Santa Rosa Animal Shelter today. The Eagle Scouts got all of the beds finished. Thanks to Dotti Brightman for cutting the material and repairing some of the odd size beds; to the volunteers of CARE of Santa Rosa County, FL and the Eagle Scouts for coordinating the attaching the fabric to dozens of other frames; to Island Quest Canvas for the donation of these amazing rolls of material pictured below, and to Coastal Canvas of Pensacola for its donation of sturdy vinyl to also help with this dog bed project. Finally, thanks to Columbus Dog Connection for instructions on making dog beds and inspiration! legs in most of the beds since they are easier to transport that way. We’ll pound the legs in when we get to our destinations. The last photo shows our beds being used at Best Friends last year. worth of handmade blankets and cat toys, dog and cat food, and other items. Why would a couple from Stillwater donate to the Redwood area shelter? “My family owns some land in the Redwood area, so we already knew of this shelter,” said Tammy, playing with dogs in the shelter’s back room. that is where I rescued my girl from, who is the inspiration for all my donations, and 10 beds to Redwood Area Friends of the Animal Shelter. and we were taking the RV anyway, why not fill it up with other stuff too, so we did! You'll see in the photos. and cats, I decided, we were going to make this a yearly donation. Not the beds, done with those, but anything and everything else they need and we can get. fencing so they can have an outdoor run for the dogs. That will be on my list of things to do for this year. All of this started with these beds, for me to buy and make to give away. you pick which ones you'd like to use. I'm Tammy, the one with the long black hair :-) Thanks for the support, and helping me on this journey! Gary & Pat delivered 8 beds to Best Friends on December 23rd. We’re getting ready to gear up and start making our 2nd set of beds. We plan on taking some of these to Best Friends Animal Sanctuary in Kanab, Utah when we visit this winter. we ended up with our own sizes and dimensions for the beds. 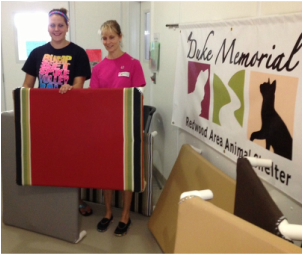 The material was donated from a company that manufactures premium outdoor patio furniture. We couldn’t have done it without your website’s information and instructions. Our first attempt (the orange one which we use in our home) was assembled using a Coolaroo replacement cover that we purchased on Walmart.com then finished off by cutting PVC to size. Thanks for your website advice and for all the good things you guys do. Used 25 yards of Cordura pack cloth which was 58" wide -- so cut in half was 29" wide and everything was adjusted from there. 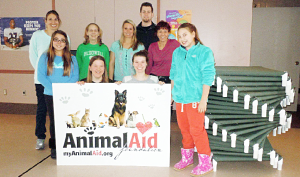 Beds were donated to Oregon Dog Rescue, New Life Family Dogs, and the local county animal shelter. Everyone was thrilled to get the beds. 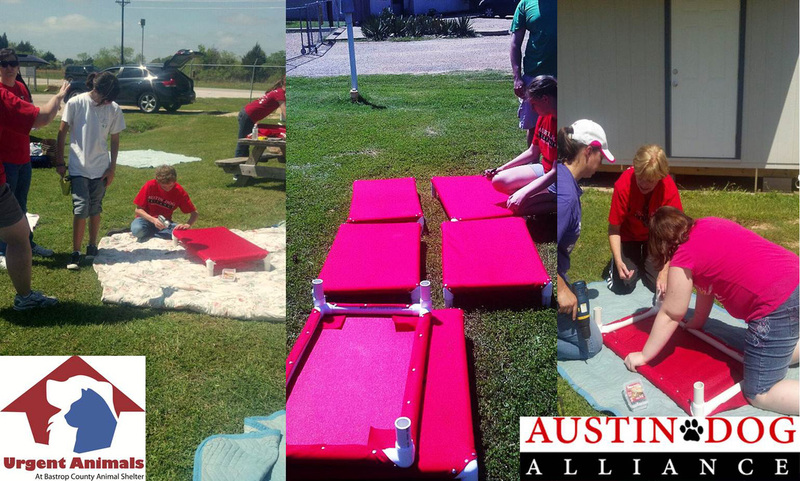 ​On August 26th, 2012 Volunteers came together to help build over 200 raised dog beds for Animal Aid Foundations 1st raised dog bed building project. Sharon Steelman spearheaded this effort which lead to over 500 beds being built/donated to shelters in Florida and Georgia! WALTON COUNTY — Sharon Steelman is working one county at a time to make sure every animal control dog has a dry place to sleep. After donating beds to all of Walton County, Steelman’s organization, Cots for Homeless Canines, is donating beds to dogs in Santa Rosa County Animal Services. Santa Rosa’s shelter received 30 test beds and has requested additional bedding for their canines. Steelman said the design for the beds was taken from another company where beds average $45 each. Dora Thomason, operations manager at the shelter, said any donation is exciting, but the beds have had a positive effect on the canines. “I’ve seen a change in attitude from some of the dogs,” Thomason said. The cots are designed to help dogs with their orthopedic health as well as being non-chewable and durable. The beds also help prepare the dogs for adoption and staying in beds at their new homes. “We’re very happy about this donation,” she said. “It is so kind and generous to just give like that." Steelman said once Santa Rosa County is complete, she has shelters to help in Panama City and Alabama. The holdup, however, continues to be funds for buying supplies. “It’s always funds that block us from doing more,” she said. “We could make 10 beds a week if we had all the materials. ”For more information on donating or volunteering, e-mail Steelman at rsteelman@cox.net. 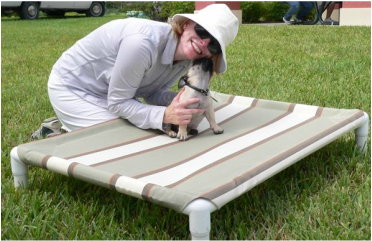 We just wanted to say "Thank You" for all of the informational resources that you have provided to rescue groups on your website for the Kuranda Style Dog Beds! We use all of the resources that you provided on your website and step-by-step, we order the materials, organized volunteers & a date to build the beds, and we did them! 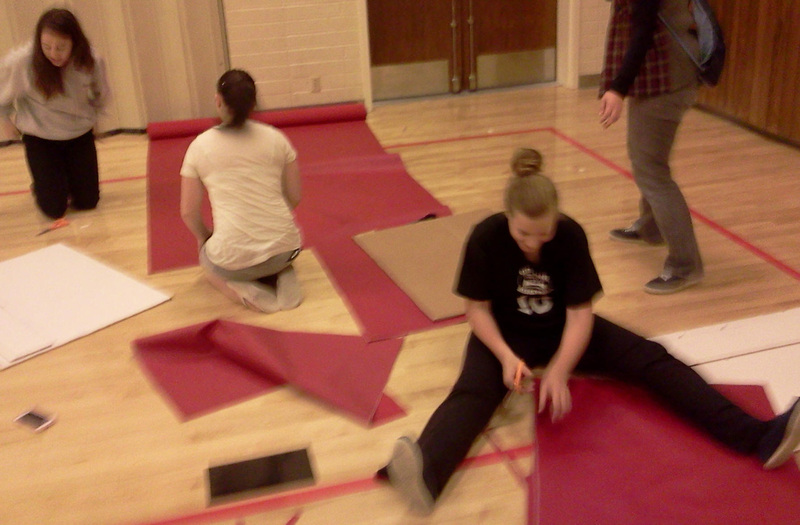 Attached is a couple of pictures of us assembling them. They just built the beds today, so we will get more pictures of the dogs sleeping on them! We are located in Bastrop, Texas - Just 45 Miles East of Austin, Texas. Our precious pups use to sleep on the cold, hard concrete floors, but now Thanks to your help, we have build a bed for every kennel. With having some of the materials donated and purchasing some, the beds ended up being $14.75 a piece! :) Thank You So Much! Please see attached picture! cold, concrete floors. "The way I see it, animals don't have anyone to talk to. They didn't ask to be born, and they didn't ask to be dropped off on the side of the road," Kattner said of the reason behind helping the homeless canines. The bed frames are made from lengths of pipe on which Kattner affixes heavy, washable canvas.The beds are elevated, Kattner said, so "dogs won't have to sleep on the cold floor in the winter or on the hot floor in the summer. 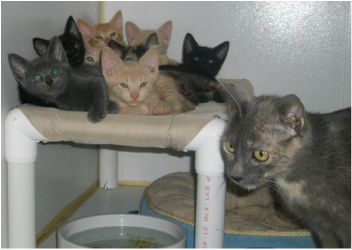 "The Animal Resource Center near Bloomsburg already uses off-the-ground beds and is welcoming Kattner's donations. He also dropped off a trial bed to the Hazleton Animal Shelter. An animal lover, Kattner found plans for the beds on a website for the Columbus Dog Connection, a group of dog enthusiasts in Ohio who rescue all breeds of canines. 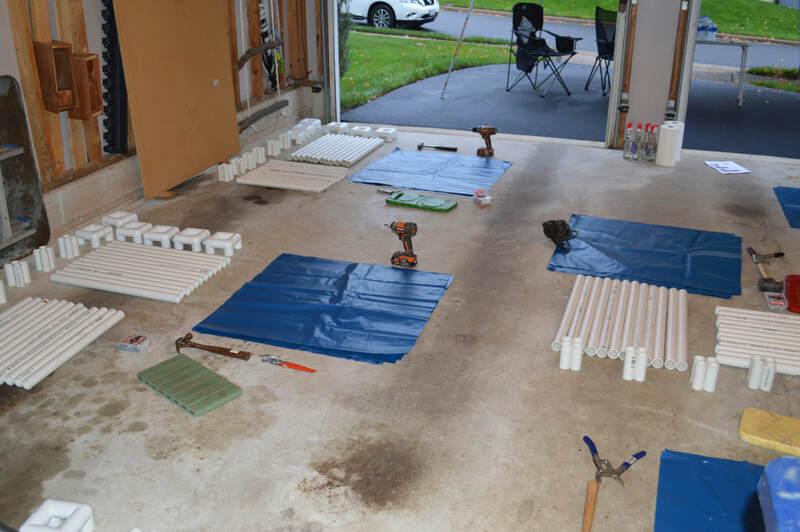 He contacted the group and learned that members had built and donated numerous beds to shelters across Ohio.He figured he could do the same locally, and shelter officials were receptive to the plans. He's making small, medium and large beds, and is hoping members of the community will assist him. For information on how to help, email him at beds4paws@ptd.net.Hazleton resident John Medashefski will help with the next round of beds, and Kattner has received support from Hajoca Corp., Hazleton Area Landlord Organization , Cedar Street Supply, Tractor Supply Co., attorney Donald Karpowich and George Hayden Inc. Those who donate will have their names added to the beds with white chalk, he said.He also invited other regional animal shelter representatives to contact him if they want to learn how to build the beds for dogs - or even cats. "I can't make beds for every shelter, but I can show volunteers how to make them," he said.Kattner said he has a deep love of animals - something he believes was instilled in him when he was growing up.His dog, Snowball, was adopted from a shelter, and Kattner encourages others to consider adopting shelter animals. 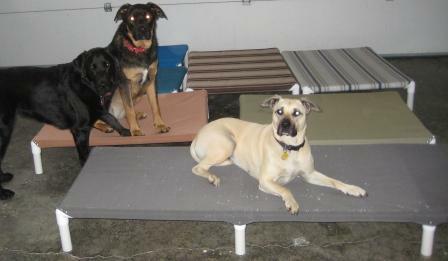 ​ Kellie, I don’t think I ever told you thank-you for your help with our elevated dog beds. The girls did a great job making the beds and they turned out really nice. 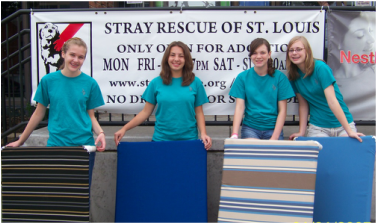 We donated them to Stray Rescue of St. Louis. ​My name is Robert Moore and I wanted to thank you for your sacrifice, love, and service to a vulnerable part of our society. My son, Caleb Moore has a strong desire to help animals much like you. He was trying to find an Eagle Scout Project, so he visited a local animal shelter and then we came across your website. 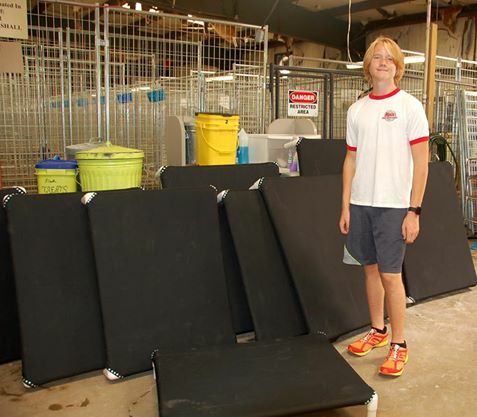 So, he decided to make 25 elevated dog beds for the shelter as his Eagle Project. Needless to say your instructions and YouTube video were extremely helpful. A Salt Lake City, Utah television station did a story on my son, your website and YouTube video. but that's OK. We even have extra materials to make a few more. :) You guys are great for helping so many dogs you'll never see and people you'll never meet. Freshman Cody Miller helps to steady a "dog condo" frame as sophomore Patrick Green attaches the cloth material to the frame, and sophomore Kyle Stephan uses a band saw to cut PVC pipe to size for the frame in the construction technology class at Madison Consolidated High School. The students' work was for the Elevated Dog Bed Project. The beds, also called dog condos, are for local shelters and rescue operations, and is being funded by Bridges for Animals in Madison and the Scottsburg Environmental Club at Scottsburg High School. Additional materials were provided by the Columbus Dog Connection in Ohio. Six large and two small beds will go to the Leota Animal Rescue facility in Scottsburg and two will go the Madison-Jefferson County Animal Shelter in Madison. 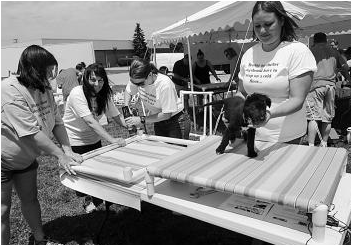 Above, Deven Godau, left, of Trainers Academy, Troy, measures fabric for a dog bed with Jackie Rudity of Retro Dogs Rescue and Lisa Patana, also of the academy, at an event called Bed-a-palooza. The T-shirt of Jamie Wolfe, right, explains it all: "Because no shelter dog should have to sleep on a cold floor." The volunteers recently made dozens of beds for local animal shelters in Madison Heights, Warren and Sterling Heights as well as poorer rural areas in northern Michigan. 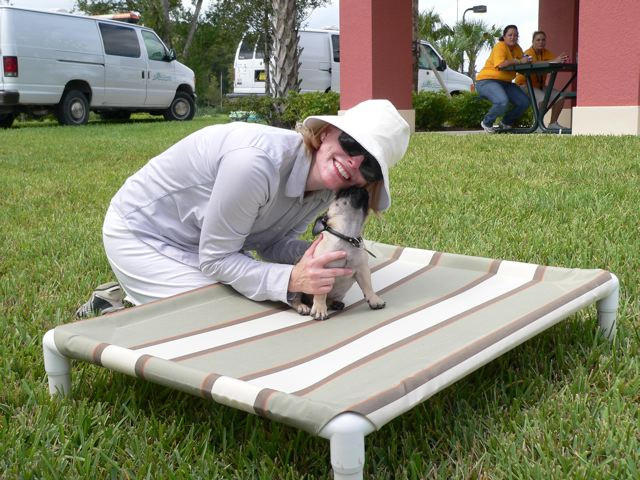 ​So far I made and delivered 129 beds to the HALO no-kill animal rescue in Sebastian Florida. I have talked to you by email a few times over the past year. I just wanted to give you an update on our progress. Save Our Homeless Pets, a local animal organization I volunteer for, has just donated another 100 of the large elevated beds to Polk County Animal Control in Winter Haven. They were delivered this afternoon. We also donated 105 in February, which brings the total to 205. 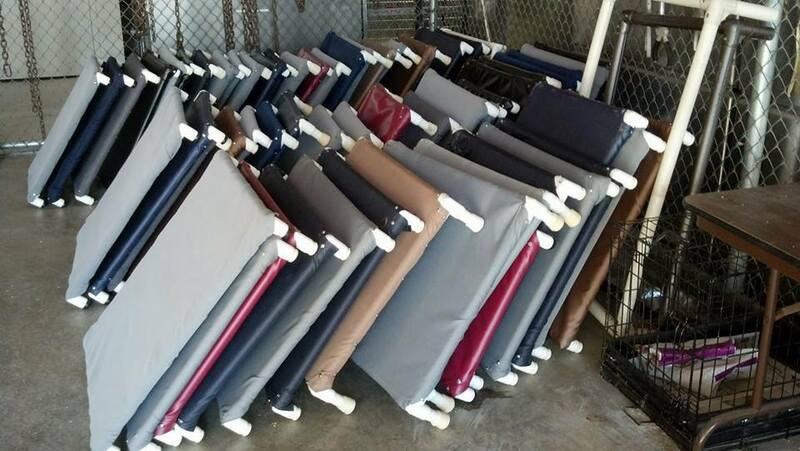 In addition, we have also recovered 61 to date with new fabric to be used again (which included some of the beds the local high school featured on your site had donated in Dec). Thanks for the wonderful website and easy to follow instructions. Mary Garcia says the first thing she did when she returned home was check the Internet for dog beds. Garcia discovered a Web site from Ohio for Columbus Dog Connection, www.ColumbusDogConnection.com. 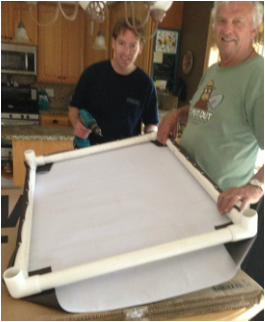 This team of a few "Doggedly Dedicated Dogmanity Do'ers," pooled its creative talents and came up with an easy and inexpensive way for anyone to build an elevated dog bed. The Web site home page shows a photo of the inspiration for a dog bed idea. The photo shows dogs in a rural shelter in Ohio sleeping on wet floors and one dog appears to be slumbering in what resembles a litter box. The Web site was just what Garcia needed to get started in her efforts to help the Polk County dogs that wait on adoption row for a good home. The site provides step-by-step instructions, a list of materials needed, and a list of suppliers who carry them. ​I thought that you might like to see the dog beds that we built for the local animal shelter. Since we have built these we have had requests for other rescues and shelters for beds and we would like to build more but we will need more material. So we would like to built 20 more beds. Home Depot donated the PVC so all we had to pay for was the corner pieces. These are just some of the beds....this picture is going into our local paper and we are going to present this idea to council for other Girl Scout troops to do. I wanted to get back with you to let you know that we will not be needing anymore awning material to make more dog beds because we have found plenty of companies willing to donate here in Cincinnati...Queen City Awning just gave us a complete 50 yard roll of brand new material because it was discontinued...in fact I cannot get to all the places that are willing to donate material. 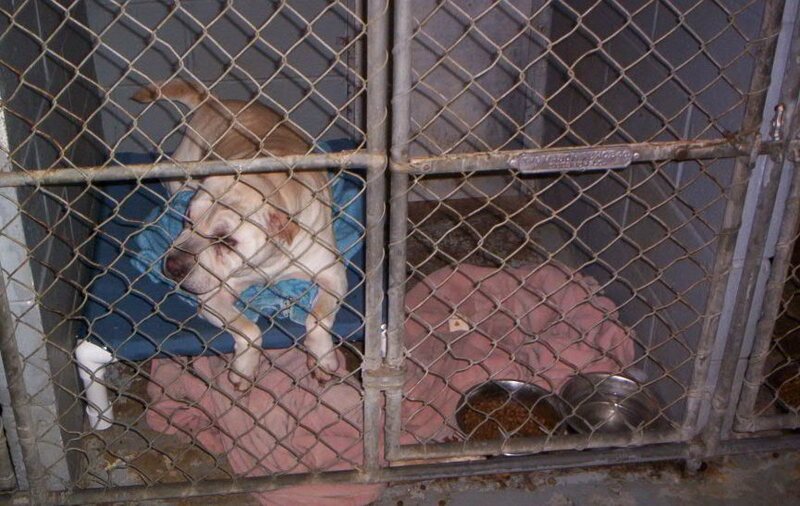 We dropped our first set of beds off at the Dearborn County Animal Shelter and will be taking our net batch to the Rising Sun/Franklin County Animal Shelter and then we are going to take a few to the local vets for the older dogs that need to spend the night for various reasons. I wanted to thank you and your wonderful organization for the elevated dog bed directions you posted on your web page! 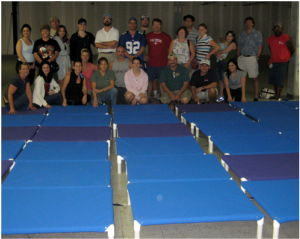 Some good friends and I recently started volunteering at a local shelter in Ft. Lauderdale and quickly realized that their larger guests were in desperate need of some good, comfy beds! ​My husband and I made 31 beds for our shelter a few weeks ago and when we went this past weekend to see how the dogs were enjoying them we were a bit disappointed. August 30, 2008 We had a ball !! 18 people turned out Saturday. We had a bed making party last Sunday. 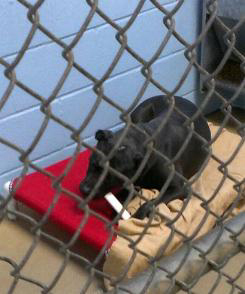 All 25 dogs got beds, their kennels cleaned, walked, brushed and got new toys, lots of treats and rawhides. We got Stanley Steamer to steam the floors. We took 8 big tubs full of food and for storage...enough food for a couple of months. We ran two outlets for wet vacs/fans, fixed the hot water heater, repaired cages, introduced dogs to people who might be able to get them out of that shelter. Thank you for sharing Dogmanity with us. We love your website, we send a lot of adopters, fosters and people who email us asking how they can help with puppy mill dogs to the Columbus Dog Connection web site. We never miss a Mingle With Our Mutts Adoption event in Dayton or a chance to tell anyone about the Columbus Dog Connection Habitat for Dogmanity and Elevated Dog Bed program.